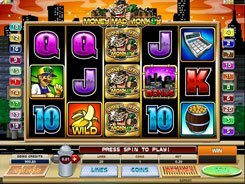 As the name suggests, the theme of this 5-reel 20-payline slot is monkeys, and the action takes place in an urban environment. The symbols set includes zookeepers, monkeys, bananas, calculators and playing card symbols. 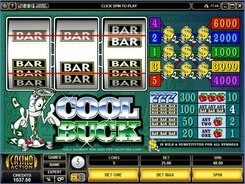 The game features a wild, a scatter symbol, three bonus games, and a $10,000 fixed jackpot. A bet size is rather flexible, but has a fairly low maximum value of $20 per spin. There are three different bonus scatter symbols in the game. Three Urban Skyline symbols scattered anywhere trigger the Trial Climb Bonus, where you have to move up the trail and climb to the top of the building to get a decent cash award en route. Three Barrel symbols trigger the Barrel Bonus. 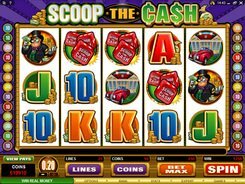 On the same screen as the reels, you are to click on a barrel to uncover a cash prize. 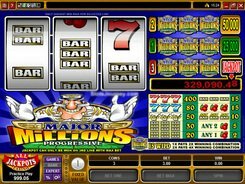 Finally, three Dollar Bill symbols occurred in any position activate the Free Spins Bonus. 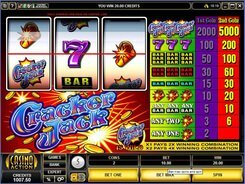 Before the free spins start, you will be asked to select a pile of cash. 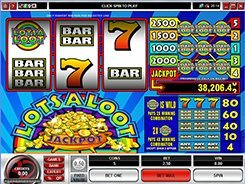 Depending on your selection, you are awarded 5 free spins at a x8 multiplier, 10 free spins at a x4 multiplier, or 20 free spins at a x2 multiplier.